Canstar’s Customer Owned Institution of the Year award is awarded to the institution that provides a strong combination of products across the everyday banking products used in consumers lives, as well as excelling in a range of institutional factors such as; accessibility, online banking and range of financial products offered. 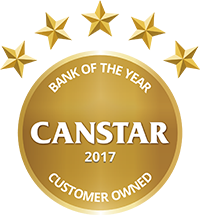 Find out why Bank Australia is the winner of the Canstar award for 2017 Institution of the Year – Customer-Owned Banking. Canstar examines the latest interest rates, fees, and features on offer for home loans and credit cards available from customer-owned institutions. Who are the customer-owned institutions? Find out who are the customer-owned institutions in Australia, including mutual banks, credit unions, building societies, and more. If you’re with a customer-owned institution, you can probably use most of the major digital wallets available in Australia. Find out which institutions are compatible with Apple Pay, Android Pay, Samsung Pay, and more.